3)Government cuts interest rate on small savings plans﻿Read more. 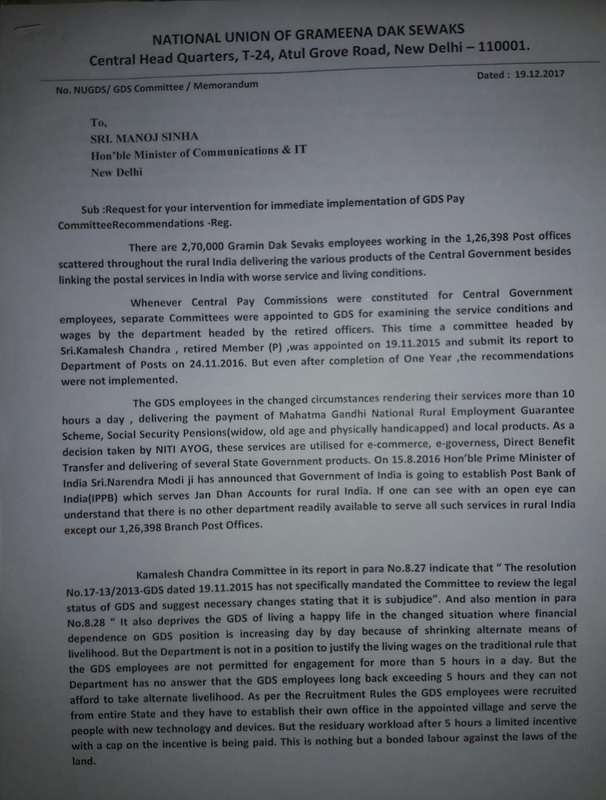 4)7th Pay Commission Bunching increment – Loss to Senior Employees fixed pay in the first stage of Pay matrix﻿ Read More. 5)Govt says No Proposal to Revise Income Tax Rates this year﻿ - Read more. 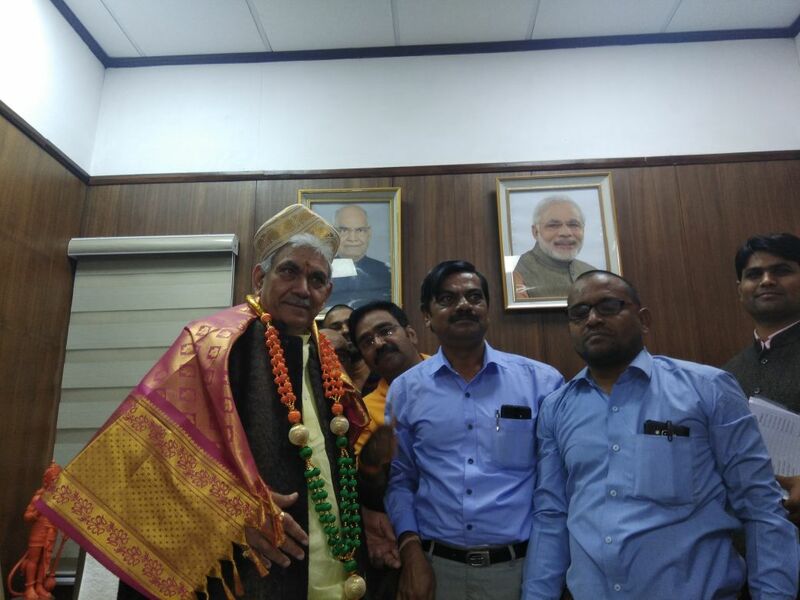 On 21.12.2017 a delegation consisting Sri D.Kishanrao, General Secretary, NAPE Group-c, Sri B.Shivakumar, AGS, Sri Sivaji Vasireddy, AGS, Sri Ch.Lakshminarayana, President, All India NUGUS and Sri L.Krishna Prasad, RR, Visakhapatnam Region AP met Sri Manoj Sinha ji, Hon’ble Minister for Communications & Information Technology at his residence and submitted memorandum on the following issues. ■Implementation of Kamalesh Chandra Committee report on GDS:The Hon’ble Minister assured to take up with the cabinet in next week. We can expect cabinet approval next week. ■Permitting the GDS employees to work for more than 5 Hours. 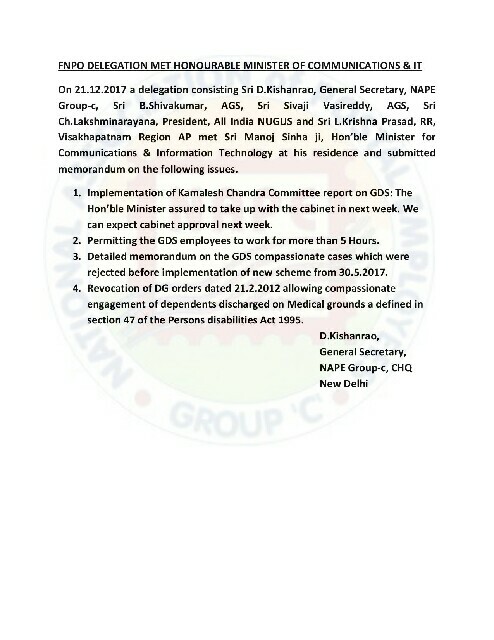 ■Detailed memorandum on the GDS compassionate cases which were rejected before implementation of new scheme from 30.5.2017. 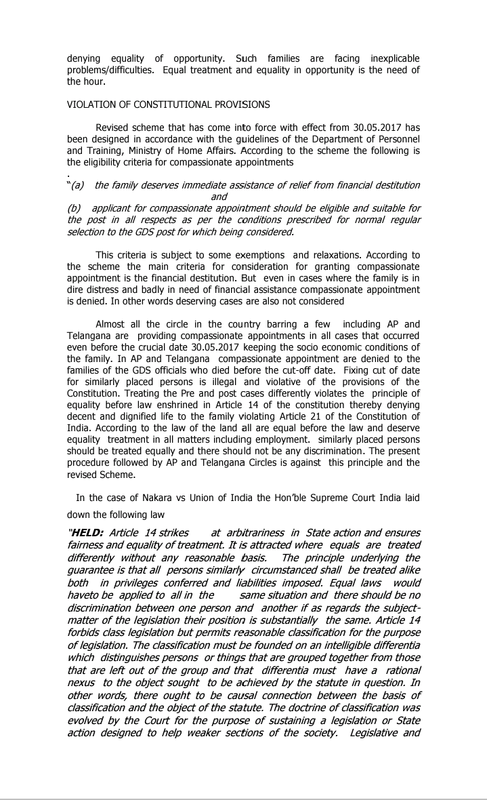 ■Revocation of DG orders dated 21.2.2012 allowing compassionate engagement of dependents discharged on Medical grounds a defined in section 47 of the Persons disabilities Act 1995. Today (20-12-2017)NAPE G/S Sri.D.Kishan Rao , Asst.GSs Sri.B.Shiva Kumar , Sri.Sivaji Vasireddy met DDG (Establishment),DDG PCC&GDS and ADG(Technology) and discussed about problems faced by the employees in CSI implementation,One Time Relaxation of service conditions for HSG I & HSG II in the light of proposed Cadre Restructuring , Compassionate engagement for GDS who discharged on medical invalidation, Consideration of previous rejected cases of GDS Compassionate engagements and submitted letters in this regard. 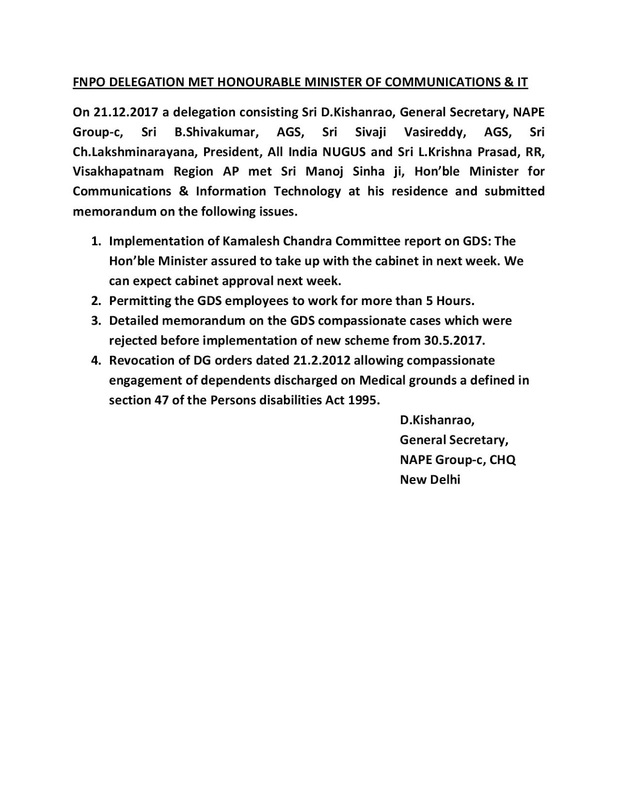 Compassionate engagement on GDS Posts to the dependents of the GDS employees discharged on #medical grounds : NAPE Gr-C General Secretary Letter to Secretary,DoP. 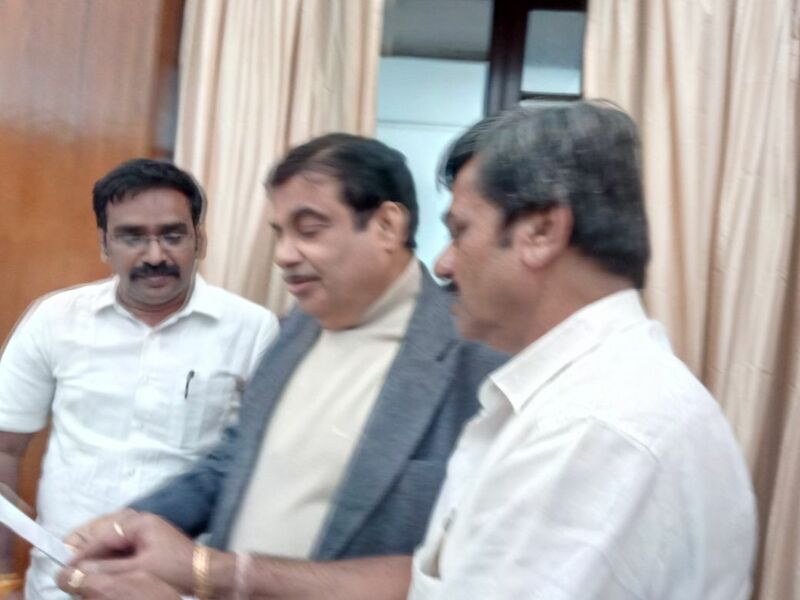 FNPO Delegation met Hon'ble Minister of Parliamentary Affairs and Minister of Chemicals&Fertilisers Sri.Ananth Kumar. 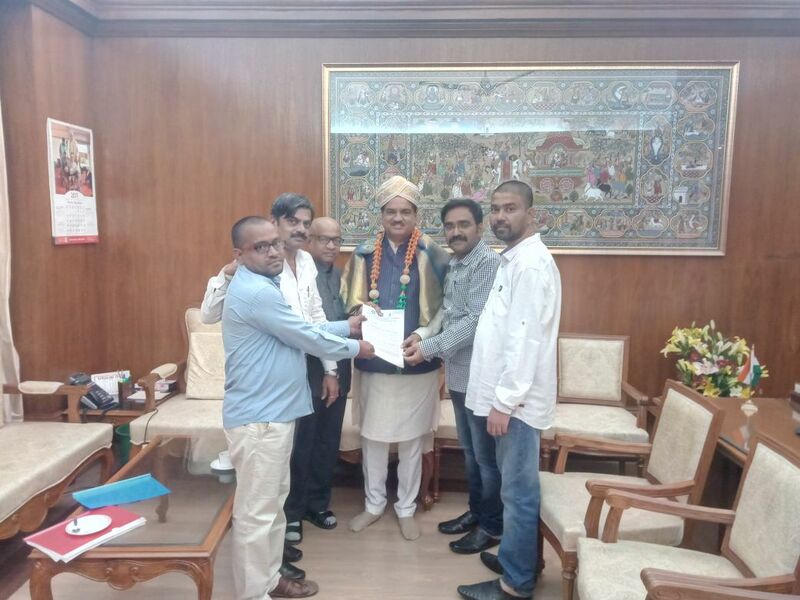 Today FNPO Delegation met Hon'ble Minister of Parliamentary Affairs and Minister of Chemicals&Fertilisers Sri.Ananth Kumar and submitted a Memorandum in his office at Parliament House and discussed regarding implementation of GDS Pay Committee Report and Hon'ble Minister assured he will take up the matter with Minister of Communications&IT Sri.Manoj Sinha and see that matter will be setteled with in a span of few weeks. 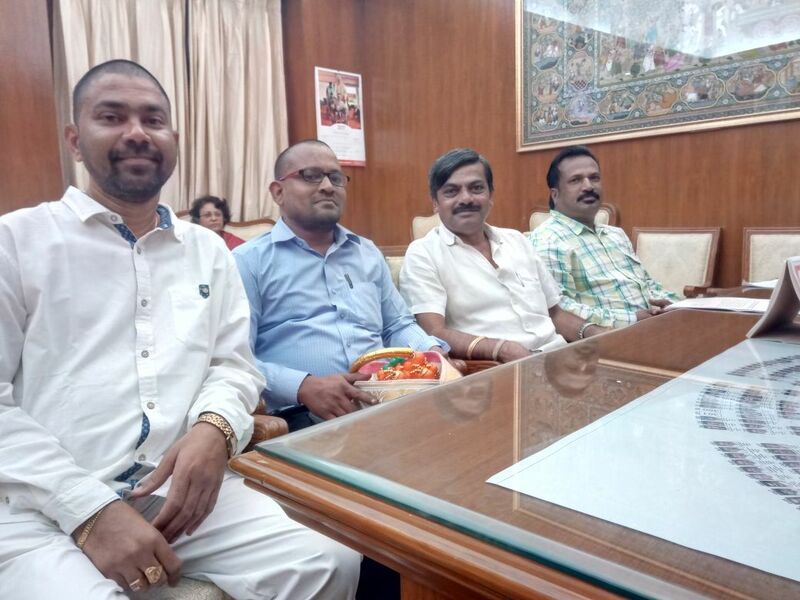 Today Sri.B.Shiva Kumar Asst.G/S , Sri.Sivaji Vasireddy Asst.G/S , Sri.CH.Laxmi Narayana President NUGDS , Sri.L.Krishna Prasad RR NAPE Gr-C AP Circle ,Sri.V.Manjappa D/S NAPE Gr-C Shimoga met Hon'ble Minister of Parliamentary Affairs and Minister of Chemicals&Fertilisers Sri.Anantha Kumar and Hon'ble Minister of Road Transport & Highways Sri.Nitin Gadkari at their Parliament Offices and requested for early implementation of GDS Pay Committee Report. 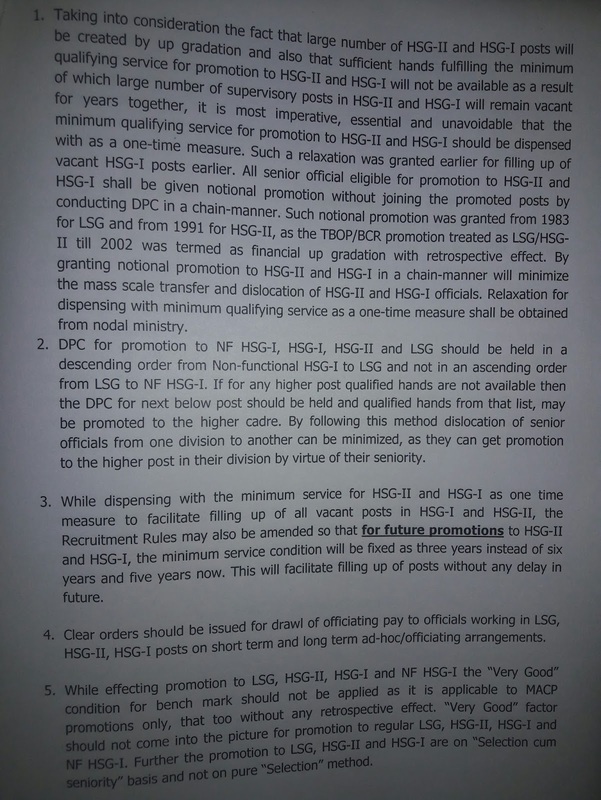 Sub:- Compassionate engagement on GDS posts to the dependents of GDS employees discharged on medical grounds. Ref: Memo No. 19-19/2009/GDS dated 21.02.2012. 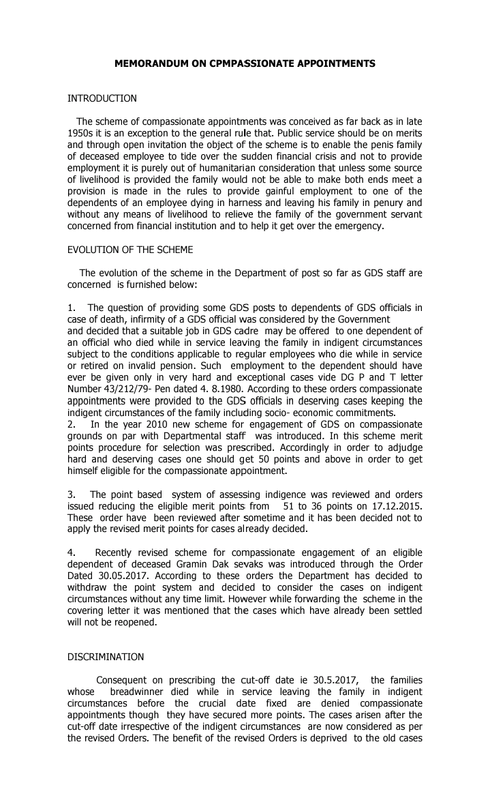 The Department of Posts issued order as referred above considering compassionate engagement of the dependents of GDS employees discharged on medical grounds. 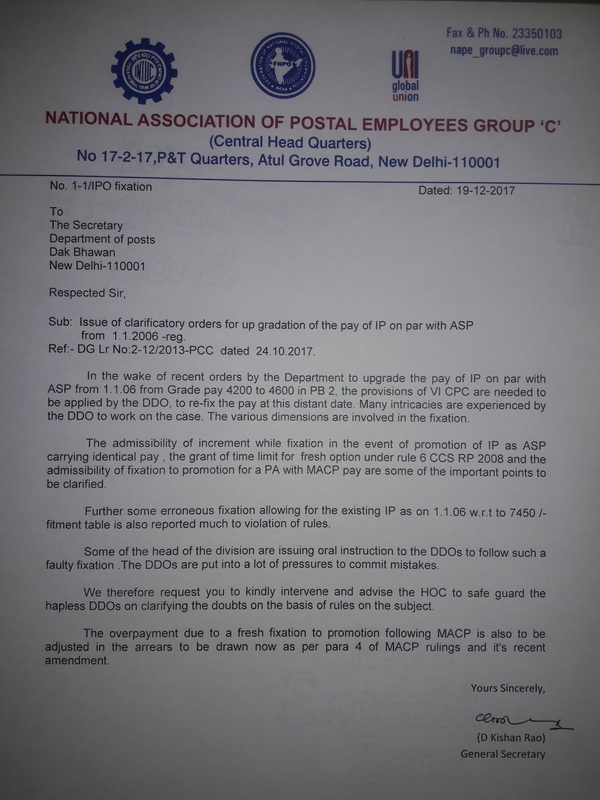 This order was issued in consonances with the Section 47 of the Disabilities Act 1995 of the Government of India which provides that no that no establishment shall dispense which are reduced in rank. 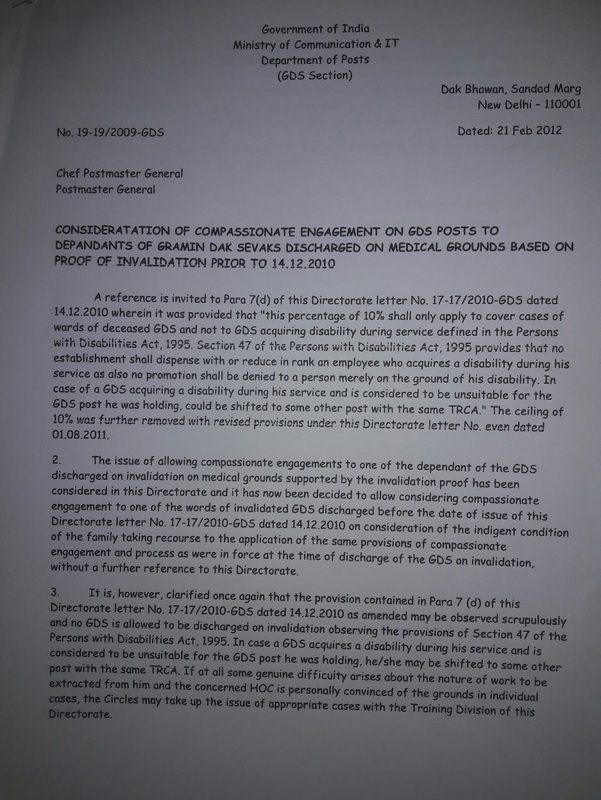 An employee who acquires a disability during his service in para 7(d) of the Directorate letter No:17-17-2010- GDS dated 14.12.2010 the Head of the Circles vested with the powers personally in case of any genuine difficulty. A copy of order is submitted here with. 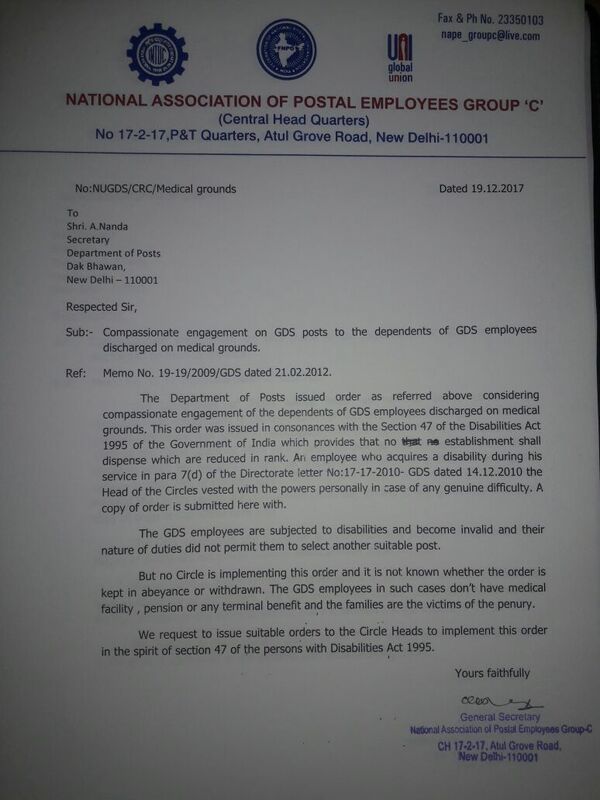 The GDS employees are subjected to disabilities and become invalid and their nature of duties did not permit them to select another suitable post. But no Circle is implementing this order and it is not known whether the order is kept in abeyance or withdrawn. 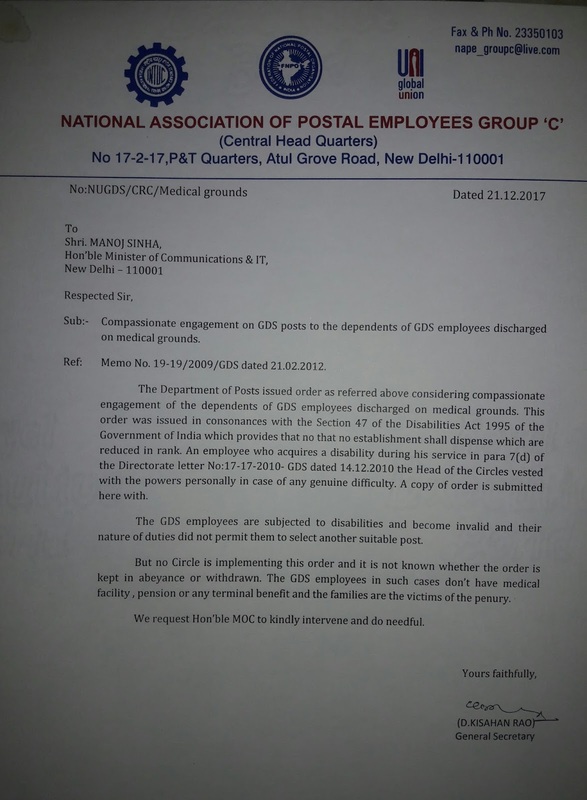 The GDS employees in such cases don’t have medical facility , pension or any terminal benefit and the families are the victims of the penury. 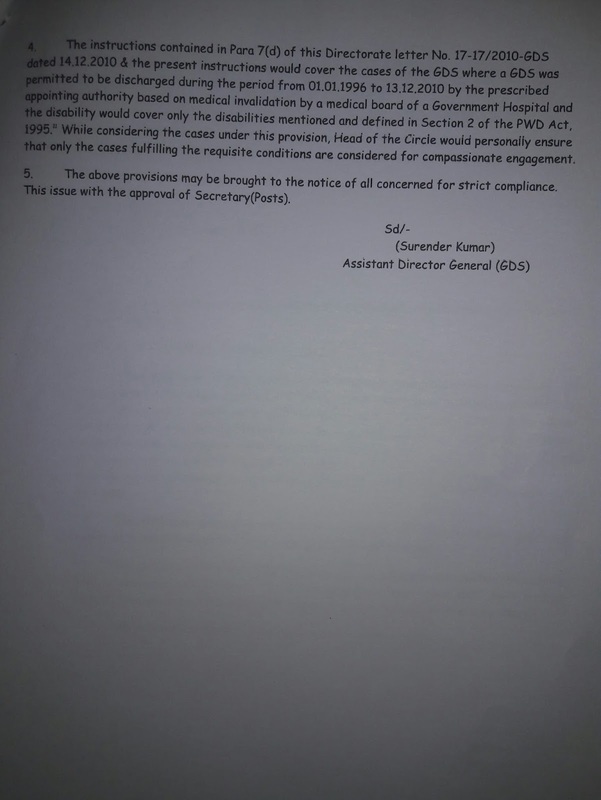 We request to issue suitable orders to the Circle Heads to implement this order in the spirit of section 47 of the persons with Disabilities Act 1995. 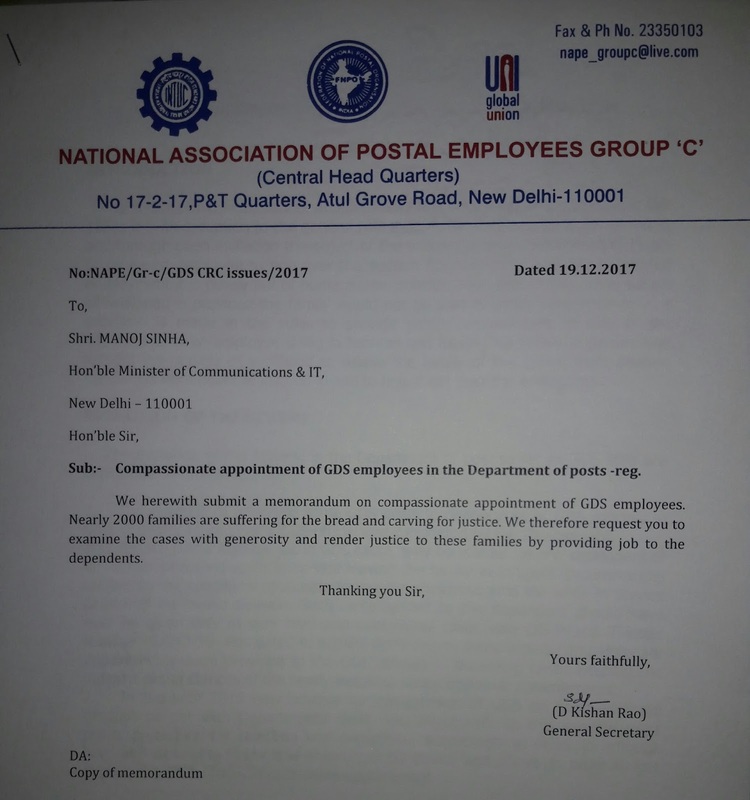 My union wish to bring the following problems related to CSI to the notice of Secretary, Department of Posts for immediate intervention and for favorable consideration. Consequent on implementation CSI, the network access is fallen down to 50% due to parallel access of CSI and CBS. 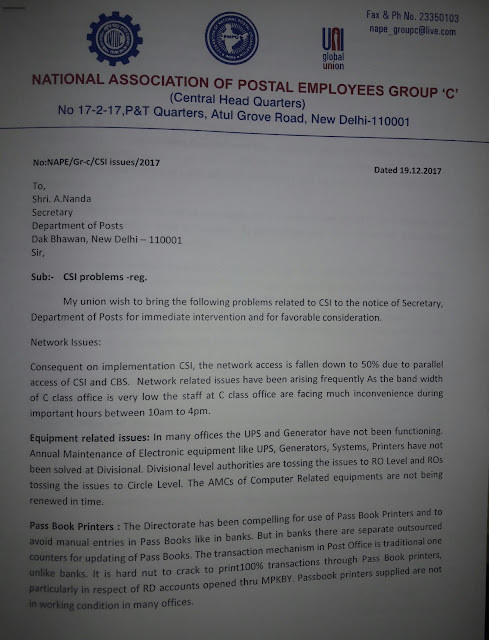 Network related issues have been arising frequently As the band width of C class office is very low the staff at C class office are facing much inconvenience during important hours between 10am to 4pm. Equipment related issues: In many offices the UPS and Generator have not been functioning. Annual Maintenance of Electronic equipment like UPS, Generators, Systems, Printers have not been solved at Divisional. 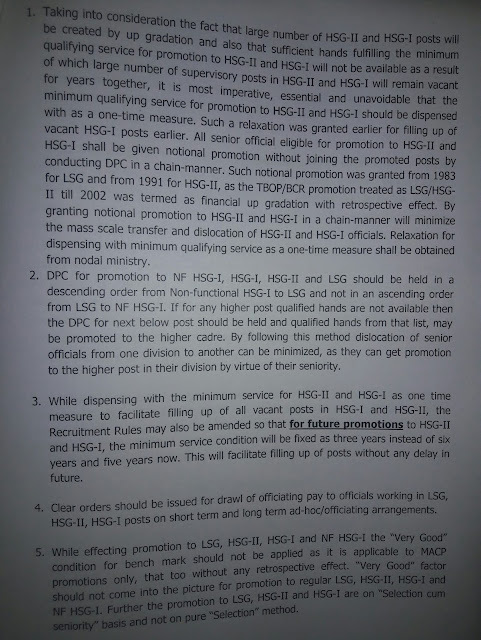 Divisional level authorities are tossing the issues to RO Level and ROs tossing the issues to Circle Level. 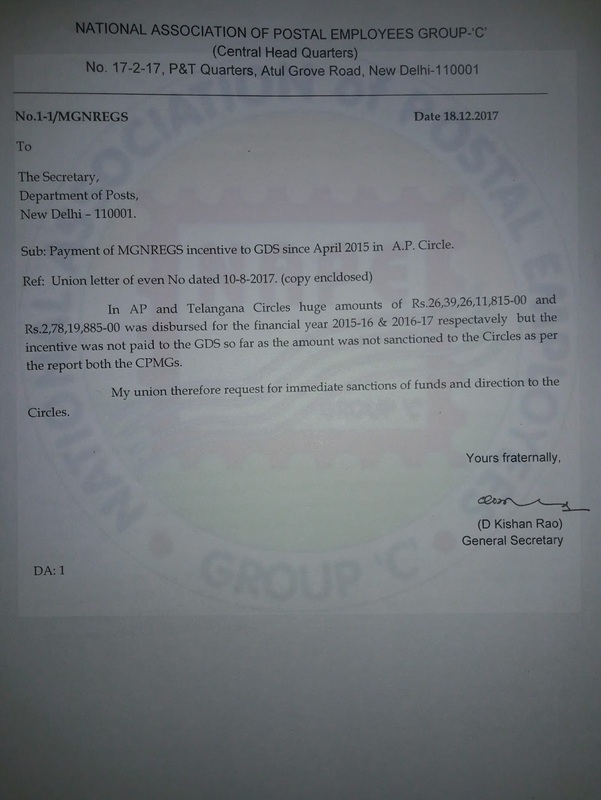 The AMCs of Computer Related equipments are not being renewed in time. Pass Book Printers : The Directorate has been compelling for use of Pass Book Printers and to avoid manual entries in Pass Books like in banks. But in banks there are separate outsourced counters for updating of Pass Books. 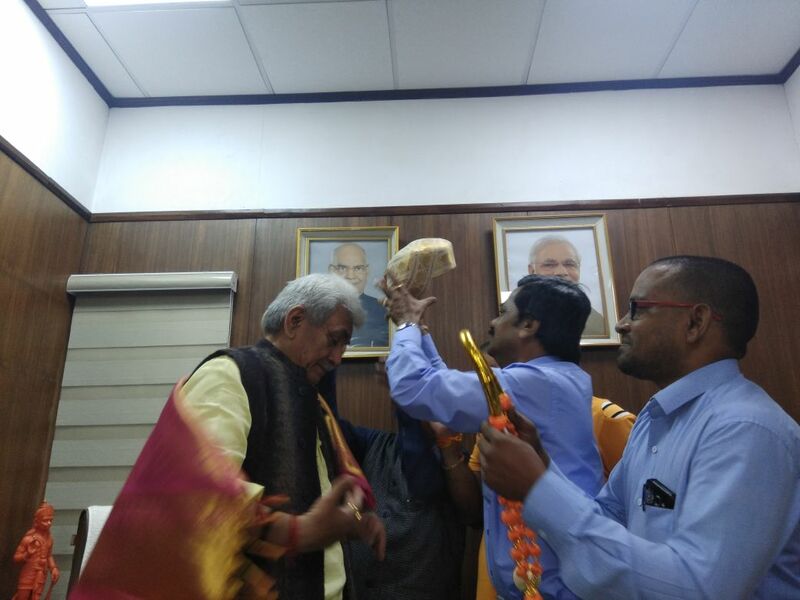 The transaction mechanism in Post Office is traditional one unlike banks. It is hard nut to crack to print100% transactions through Pass Book printers, particularly in respect of RD accounts opened thru MPKBY. Passbook printers supplied are not in working condition in many offices. 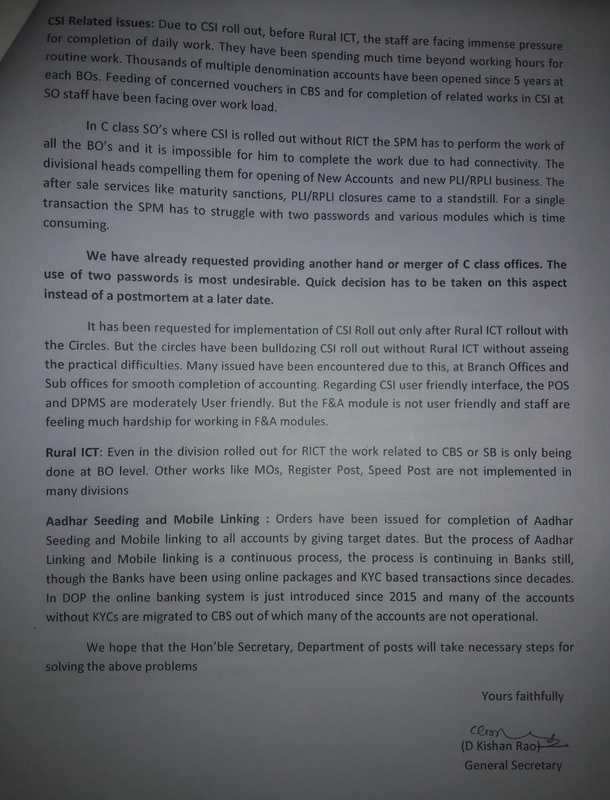 CSI Related issues: Due to CSI roll out, before Rural ICT, the staff are facing immense pressure for completion of daily work. They have been spending much time beyond working hours for routine work. Thousands of multiple denomination accounts have been opened since 5 years at each BOs. 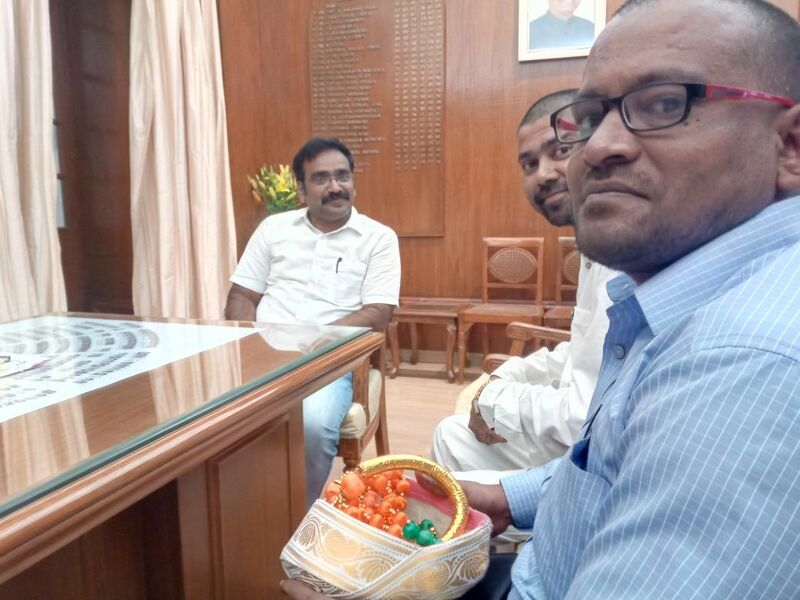 Feeding of concerned vouchers in CBS and for completion of related works in CSI at SO staff have been facing over work load. In C class SO’s where CSI is rolled out without RICT the SPM has to perform the work of all the BO’s and it is impossible for him to complete the work due to had connectivity. 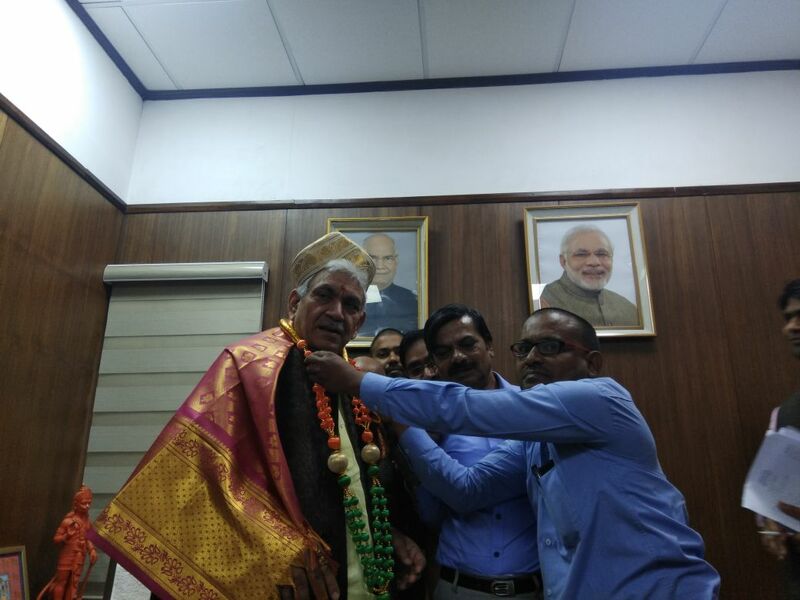 The divisional heads compelling them for opening of New Accounts and new PLI/RPLI business. The after sale services like maturity sanctions, PLI/RPLI closures came to a standstill. For a single transaction the SPM has to struggle with two passwords and various modules which is time consuming. 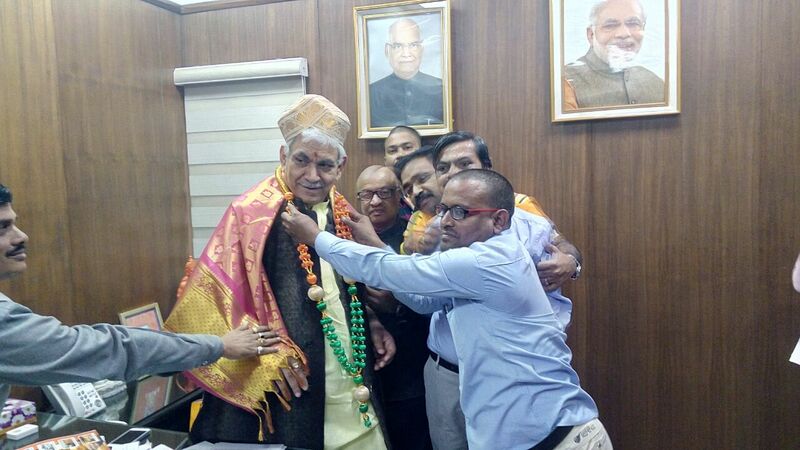 We have already requested providing another hand or merger of C class offices. The use of two passwords is most undesirable. Quick decision has to be taken on this aspect instead of a postmortem at a later date. It has been requested for implementation of CSI Roll out only after Rural ICT rollout with the Circles. 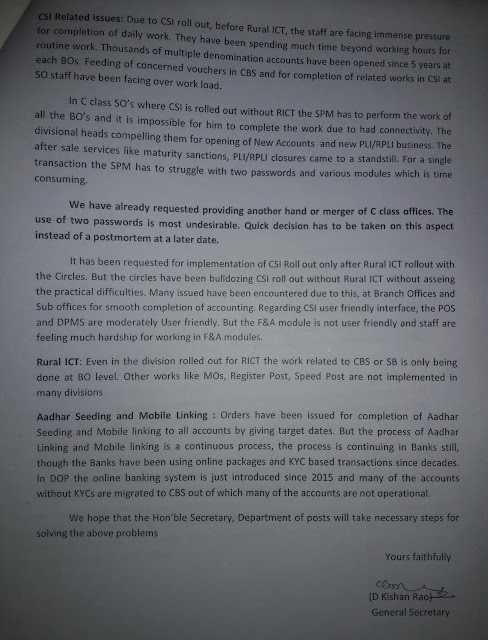 But the circles have been bulldozing CSI roll out without Rural ICT without asseing the practical difficulties. Many issued have been encountered due to this, at Branch Offices and Sub offices for smooth completion of accounting. Regarding CSI user friendly interface, the POS and DPMS are moderately User friendly. But the F&A module is not user friendly and staff are feeling much hardship for working in F&A modules. Aadhar Seeding and Mobile Linking : Orders have been issued for completion of Aadhar Seeding and Mobile linking to all accounts by giving target dates. But the process of Aadhar Linking and Mobile linking is a continuous process, the process is continuing in Banks still, though the Banks have been using online packages and KYC based transactions since decades. In DOP the online banking system is just introduced since 2015 and many of the accounts without KYCs are migrated to CBS out of which many of the accounts are not operational. 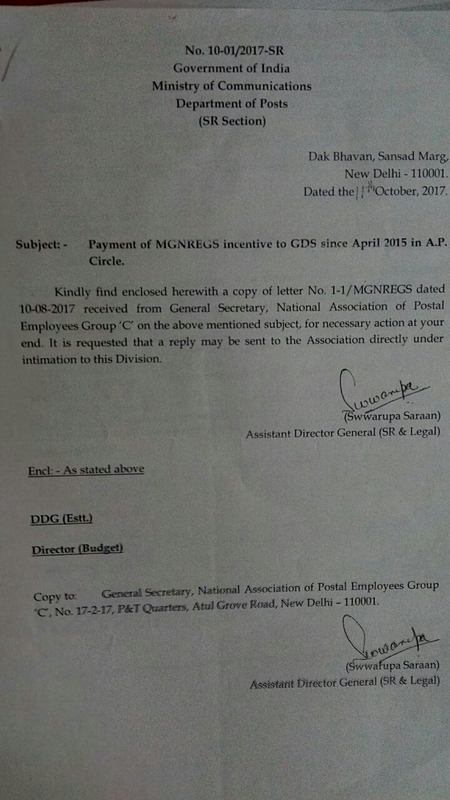 2.Payment of MGNREGS Incentive to GDS since April 2015 in AP & Telangana Circles. 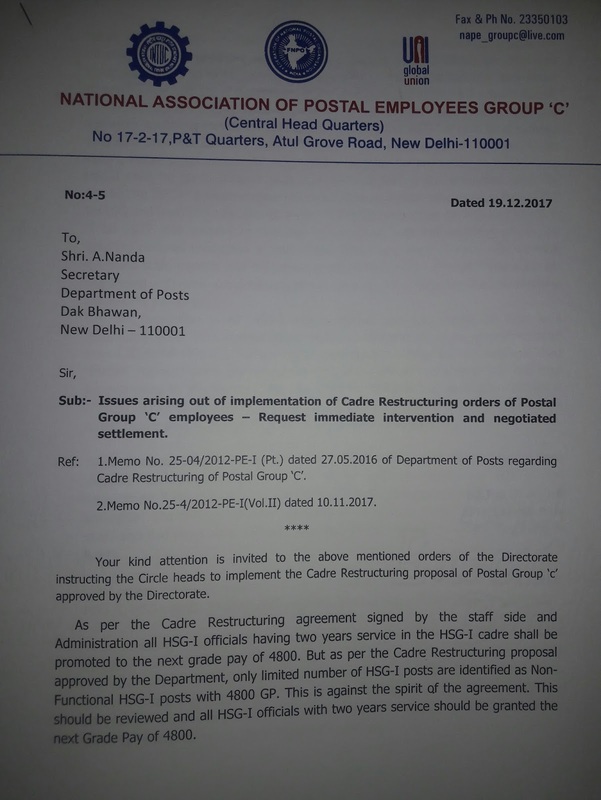 3.Allowing GDS employees to officiate as Postal Assistants in vacant posts. 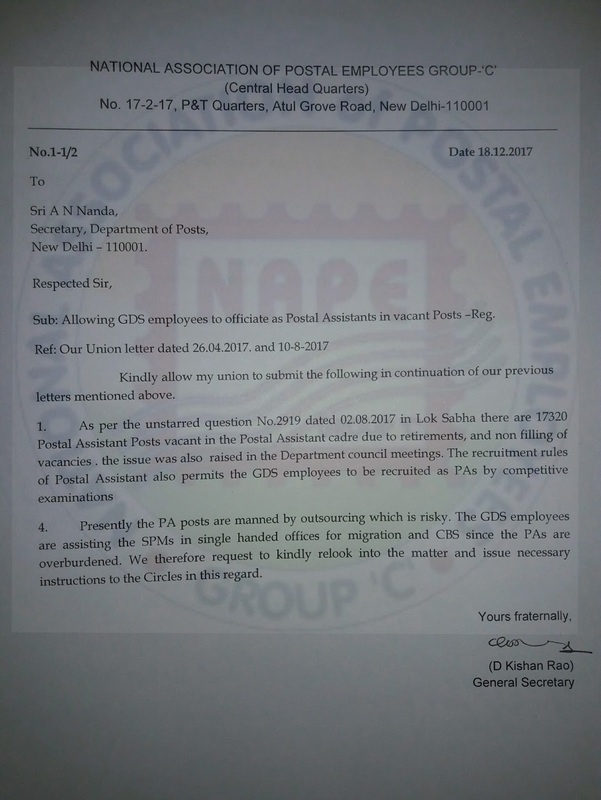 Today (18-12-2017) the General Secretary NAPE Group-c along with GS, AIPEU, Group-c met Secretary, Department of Posts and continued for more than half hour and discussed the following. 1. 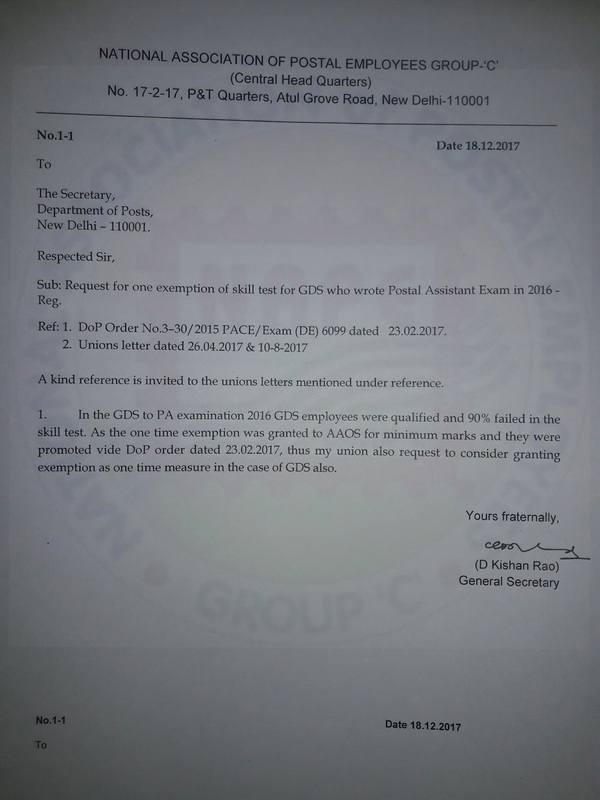 Early implementation of GDS committee report : It is under active process and try to issue orders in January 2018 after approval from Central Cabinet. 2. 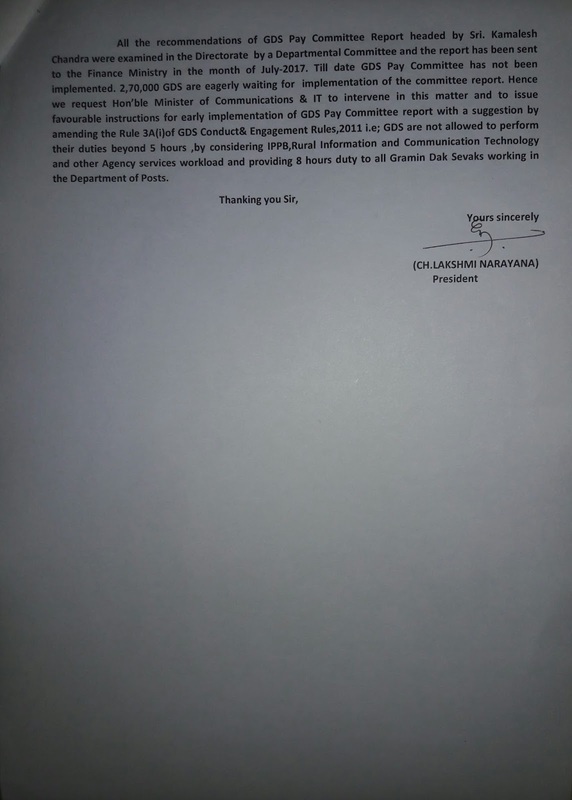 IPPB: While thanking for issue of notification for deputation of officials including GDS, we requested more participation of GDS in the scheme. 3. CSI issues: We demanded supply of RICT devices to BO's and implementation of CSI afterwards providing hand to C class offices, password problem and abnormal workload for C class SPM's. 4. 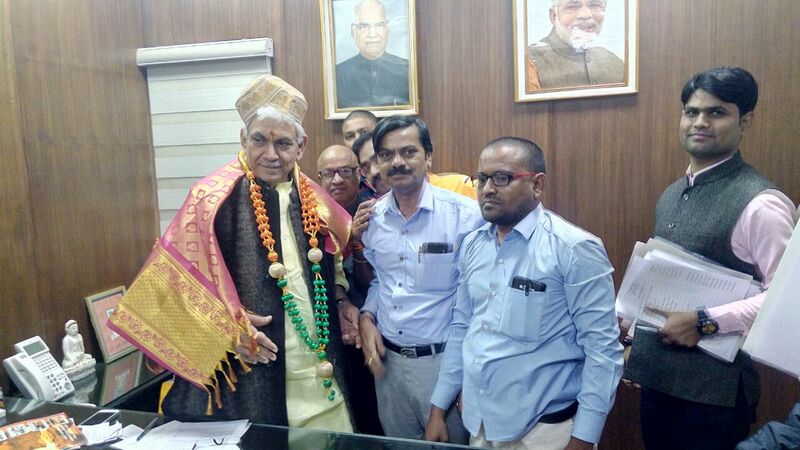 Immediate notification of Departmental Council - Separate meeting on IPPB. 5. 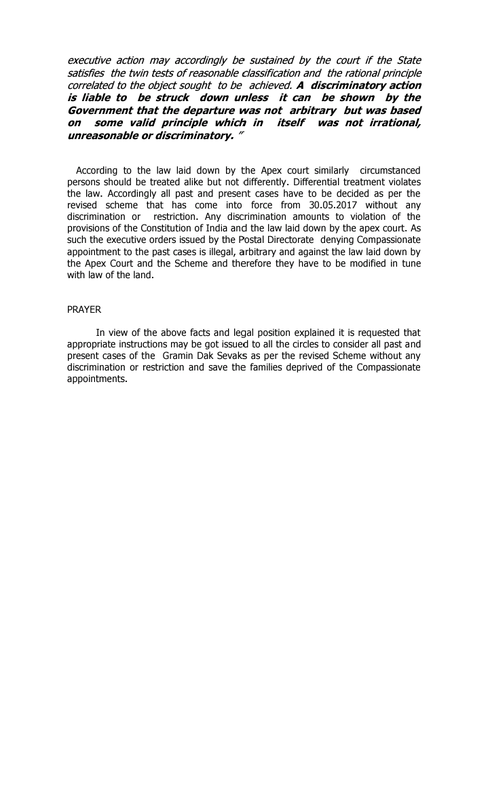 Implementation of Appex court judgments on MACP issues. 6. Payment of dress allowance of Rs.10000/- instead Rs.5000/- to the staff who are eligible as the order is ambiguity. 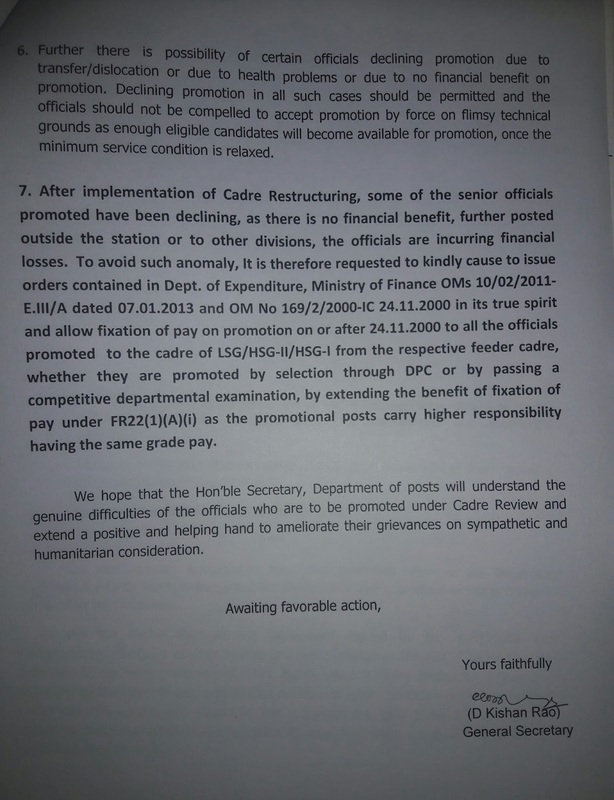 The Secretary wanted some more time for stabilization of CSI roll out and requested for cooperation of Group-c. Roll out problems are vigorously perused with TCS. Aggregation of ports for better connectivity is under process for more connectivity.